Jazzers, rockers, bluesmen, twangers, funksters, metal heads and polka players take note – this highly addictive new set of jazz blues guitar lessons from monster of the six-string, Frank Vignola, will inject such massive degrees of soul and groove into your improvisations that you’ll likely not be able to put your instrument down for weeks on end. So, skip the following description, download the course immediately and bid your family and friends a loving fare thee well. You’re gonna be happily busy for a while. If you play any style of contemporary music from this century, the blues is genetically tied to it in one way or another be it progressions, scales, phrasing or just plain groove. We all share the same 12 notes in western music but there’s something extraordinary about the way a great blues solo grabs your attention, turns your head and gets your feet moving. It’s a primal thing. When most of us were just coming up, we copped blues lines from our heroes of the Classic Rock era who in turn copped their lines from the crop of “authentic” blues giants like T-Bone, all of the Kings, Muddy, Bo Diddley, Lightnin’ and dozens of other giants of the genre. For players, this form was relatively easy to learn with its basic I-IV-V progressions and rather limited vocabulary of phrases and techniques. Thus its popularity amongst young guitar players. Meanwhile, another strain of the blues had its very own happening thing going on; Jump, West Coast and Jazz blues all of which stemmed from the jazz form. As you might guess from its title, Vignola’s Jazz Up Your Blues pays homage to the latter. Wes Montgomery, Kenny Burrell and George Benson are just three of many killer players who were blowing minds with jazzed up pentatonic lines back when most of us were just sparkles in our parents eyes. Similar to most jazz forms, this style is more sophisticated and thus more challenging to get a solid grip on but easily worth every minute in the shed getting there. Frank’s Jazz Up Your Blues will indeed get you there, and get you there fast. Plus, you’ll have a ton of fun following Vignola’s format for the course. No tedious theory to assimilate. No exercises to master. As with most of Frank Vignola’s guitar lessons, you will play your way through the course and start blowing jazzed blues lines right from the very first lesson. For those of you just returning from the Jupiter expedition, Frank is one of the most accomplished, multi-dimensional players walking the planet today. Monster player, composer and improviser, Frank plays proficiently in every genre, from jazz to bluegrass to acid rock and everything in between. Longtime protege of Les Paul, Frank’s played with everyone and his brother and has a pedigree a mile long. A quick Google will yield 71,300 other reasons why you might want to apprentice under Vignola. 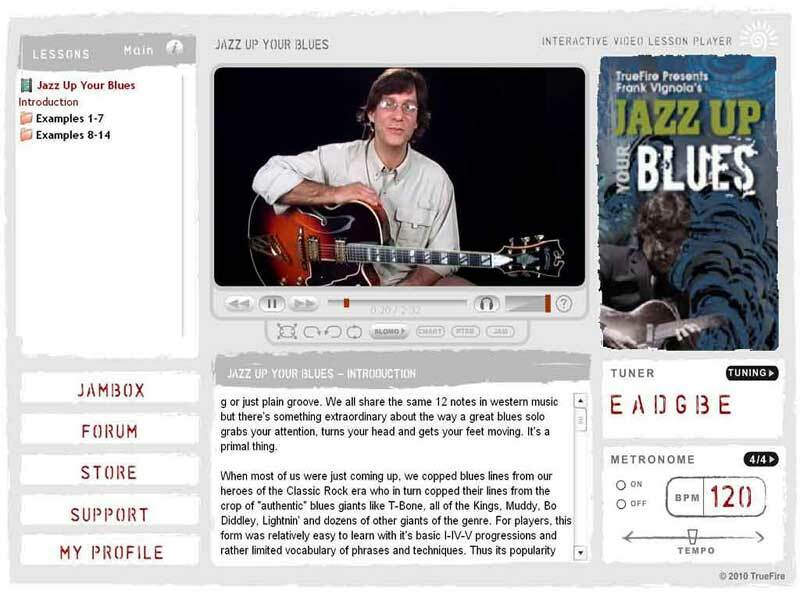 Jazz Up Your Blues is comprised of 14 lesson sets where Frank first performs a solo over a practice rhythm track. Vignola deliberately constructed each solo to showcase essential jazz blues vocabulary and techniques. Frank then breaks it all down, move-by-move. You then work with the video, tab and notation to get it under your grip, and then perform it yourself over the track. The 14th lesson set features multi-chorus demonstrations of both comping and soloing, with emphasis on interacting with other band members when in an improvisational context (this set’s worth the price of admission alone). Hands down, Jazz Up Your Blues is one of most engaging courses with as much sizzle as there is steak. If you’ve always wanted to nail this style of the blues, Frank gives you the hammer to do it with. Even if blues or jazz isn’t your bag, the Jazz Up Your Blues guitar lessons will maximize your groove and help keep it there for years to come.